IF YOU’RE DRIVING the Wild Atlantic Way this summer, you may find yourself in the little village of Leap, Co Cork – it’s right between Clonakilty and Skibbereen. Here you’ll find Ger’s Wild Atlantic Diner, a friendly spot with great food – and a secret place on its grounds. You couldn’t see the waterfall when I bought the place so I built the whole lot up – I thought [the fairy village] would suit the area. 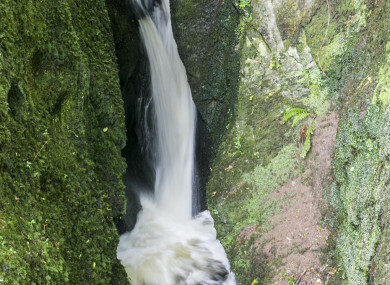 Go behind Ger’s and you’ll find a waterfall and gorge, both of which are stunning. But the real secret is the village built exclusively for the use of local fairies – a tiny town in miniature. The village is situated next to Leap waterfall, so it attracts quite a number of tourists – if only by accident. The fairy village has a tiny bridge (for fairies to cross the river), plus paths, buildings and even a castle. It’s been a big hit since it opened two years ago, Ger O’Sullivan said, both kids and adults alike. “We get a few hundred people passing through every day in the summer” he says – and that’s without advertising the village. There are hidden models of homes throughout area to the rear of the diner, including by the waterfall. Ger’s fairy village has been growing every year since it went up: he’s added “a few more houses” and has plans for it to grow in the future, though he remains tight-lipped about what is in store for the village. West Cork is well-known as one of the most beautiful places in the world, but it also has a long-standing connection to folklore and storytelling – so if there’s anywhere in the world you’d expect to find fairies, it’s here. Email “Double Take: The fairy village tucked behind a West Cork café ”. Feedback on “Double Take: The fairy village tucked behind a West Cork café ”.